*Please expect a call from the practice to verify any additional information* Chirag H. Parikh, M.D. is a board certified Ophthalmologist and is fellowship trained in the diagnosis and medical/surgical treatment of Glaucoma from New York Eye and Ear Infirmary, a leading Ophthalmic hospital in the nation. Dr. Parikh sees patients from age 7 and up. 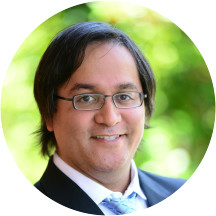 Dr. Parikh graduated from Emory University in 1997 with an undergraduate degree in chemistry and was inducted into Phi Beta Kappa (National Academic Honor Society) and the National Dean’s List. He continued on to attend the Emory University School of Medicine where he received the Joseph B. Whithead Surgical Scholarship in 2001-2002. He graduated in 2002 With a Doctor of Medicine (M.D.) Degree. During his medical school years, he did research with and published several papers with Dr. Henry Edelhauser, a leading researcher in the field of Ophthalmology, in the Emory Eye Center and was awarded an RPB (Research to Prevent Blindness) Medical Student Fellowship in 2000-2001 and then an NIH (National Institutes of Health) National Research Service Award (NRSA) training grant in 2002-2003. Dr. Parikh went on to complete his internship at Baptist Health System in Birmingham, Alabama. He then completed his residency training in Ophthalmology at the University of Medicine and Dentistry of New Jersey in 2007. He was privileged to continue on to do a fellowship in Glaucoma under Drs. Robert Ritch, Jeffrey Liebmann and Celso Tello at New York Eye and Ear Infirmary and graduated in 2008. After this, he served as a clinical instructor in the Glaucoma Clinic at New York Eye and Ear Infirmary from 2008-2009. I decided to go to this eye doctor because I wasn’t too confident with the last specialist I went to. They were friendly and quick, and I would highly recommend them to anyone! Everyone in the office was friendly, especially the lady that took care of me before seeing the doctor. The doctor himself was very friendly and answered all my questions and explained everything very well. Very nice staff. Sara was very personable and helped us in finding a place to get my daughter some glssses reasonably priced. Very clean office and smelled great. The office was very clean and smelled nice. The staff was friendly and professional. The doctor was friendly and not rushed. Excellent. Explained the risks, alternative and benefit of cataract surgery. Asked if the patient understood and had questions. Very personable and easy to speak with. Great bedside manners. The office was very clean an the wait time was less then 30 minutes he was very professional an took his time as this was the first time to have my eyes check. I was very pleased. the dr was very nice and professional.the office staff was also very nice and knowledgable. The office. Visit was fine however the office sais they did not receive tche appointment made through this site so I had to call and make the appointment. Excellent physician. Knows what he is doing. Explains the issues in detail. Spends enough time. Dr. Chirag Parikh, MD has no appointments on Zocdoc right now.